We need additional information about your vehicle to help you select the correct part. Please contact us by Live Chat, Text Message or Phone. Rear Rotor Outside Diameter (in): 12.100 in. Your car is your daily driver … and your weekend racer. 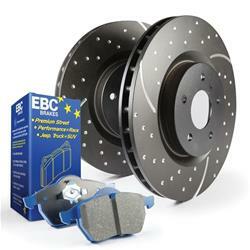 EBC Stage 6 Trackday disc brake kits will equip your car to stop on a dime—on and off the track! Stopping power is extremely important, and these brake pad and rotor combos will deliver a powerful bite. Plus, the rotors feature a GEOMET coating that not only looks great but prevents corrosion. They'll dress your car for high performance use and a long service life. Your car can pull double duty, but rarely can brake pads be good on the street and track ... unless they're part of EBC Stage 6 Trackday disc brake kits.